Reasons to Live: Finding Your Purpose after Retirement or Financial Independence - Can I Retire Yet? What, exactly, is the point of retirement? With all our focus on the mechanics of saving and investing, it’s easy to lose sight of the bigger picture. Is financial independence really your goal, or is your ultimate purpose something that lies beyond the dollars, something that wealth enables but doesn’t deliver on its own? In other words, what are you retiring to? If you’re reluctant to tackle the bigger question, ask yourself this: Can you really find meaning and happiness in retirement without a larger purpose? It’s great to finally enjoy unlimited free time for sleeping, having fun, going where and when you want. But, for many of us, happiness is about more than just staying busy in retirement. Speaking for myself, there needs to be an element of creativity or service. Otherwise there are nagging questions of self-worth. It’s hard for me to envision a happy retirement without any higher purpose…. And yet, after decades of career productivity, most of us do want to ease off the gas pedal in retirement. A balanced life becomes more important. One observer writes that the key to retirement well-being is to maintain a balanced “life portfolio” where you focus on four key areas: health, people, pursuits, and places. So, what is the point of retirement? This question has come to the center for me lately, as I’ve been expanding my interests and my retirement has entered a more traditional stage. I’ve also been talking to readers about how they’ve found meaning in retirement. Here’s what I’ve learned so far…. At its simplest, meaning can be defined as being connected to something larger than the self [Seligman, 2002]. This can take on spiritual qualities, but can also be felt by participating on a sports team, belonging to a family or club, or becoming involved with an important cause. So, while meaning provides a sense of belonging, comprehension, and significance, purpose can in turn provide meaning. In the past year, I’ve started talking to retired family, friends, and blog readers about what has given them purpose at this stage of life. A number of clear themes have emerged — ten activities that successful and happy retirees pursue. If you are rudderless in retirement, you could do worse than to pick a couple of these and jump in. They’ve provided meaning for many. There’s a lot of diversity here, and a lot of range within each item. Don’t spread yourself too thin either. A successful retirement is not about doing all of these things, replacing the stress of a job with the stress of too-many volunteer activities. Rather, pick one or two items that strike a chord, and discover if they bring a sense of purpose and well-being to your life…. Recreation — Retirement is a golden opportunity to catch up on any fun you might have missed during your working years. It’s proof that all work and no play can make for a dull life. But the opposite is true too. A retirement made up exclusively of recreation is likely to be shallow and meaningless. As Todd Tresidder relates, the “pro leisure circuit” might be entertaining for a few years, but most of us will want more. Hobbies — Almost everyone has some interests that they were forced to put on the shelf during their working years, that are not primarily about producing income or achieving success. Retirement is a great opportunity to pursue your passion for collecting or creating, for example. Often these pursuits will offer opportunities for connection and service too. Sometimes they can even produce a little retirement income. Homesteading — Though owning, decorating, or remodeling a home is not a passion for me or my wife, for many, even the majority, it is. I see plenty of retirees using their free time in retirement to relocate and craft a new home for themselves, geared to this stage of life. It’s a source of great satisfaction for many. Though, at the extreme, I see some needlessly “upsizing” rather than “downsizing” in retirement, and others focused on a seemingly endless stream of remodeling projects. For most of us, a balanced retirement requires looking outside the home as well. Travel — If there is one universal desire among retirees of all income levels and viewpoints, it’s to travel. While shoehorned into the typical work/vacation schedule, most of us never had time for more than a few weeks of travel annually. In retirement, your travels can stretch into months, or years. You can do short-term rentals or purchase an RV and take the time to really get to know your country and world. For some retirees, travel becomes the central focus, as they stay on the road for years at a time. It can be a magical lifestyle with immense rewards. Fitness — Another common thread among retirees is a desire to turn back the clock, or at least slow it down, by refocusing on health and fitness. It is so easy to let your health slide during the years of working and raising a family. While prioritizing making a living and caring for kids, it’s all too common to let your diet, weight, and strength deteriorate. In retirement, you can take the time to learn about and improve your physical health and sense of well being. For some of us, this becomes a lifelong reeducation project. Better health in turn enhances all your other retirement activities. Learning — The time and space of retirement allows you to ask, “Who am I, and what really interests me?” It’s the perfect opportunity for learning and self-improvement in whatever dimension appeals to you. Some retirees return to formal schooling, many more pursue informal education through reading, online classes, or educational travel programs. The joy of learning, becoming better at what interests you, can be a lifelong source of satisfaction. And there are no tests or grades! Mastering a subject provides its own rewards, and can lead to external connections as well as personal growth. Encore Career — Retirement is not necessarily a time to stop working. It is a time to stop working at tasks you don’t like, or for money alone. Some retirees launch full-fledged second careers, ideally in a less-than-full-time occupation. Many of us use this opportunity to indulge our inner entrepreneur. Retirement is a great opportunity to launch a small business, because you have free time to invest, and no urgent need to produce income. One caveat: this is not an invitation to risk your nest egg on a startup scheme or expensive franchise. Leave the big, risky bets to others. Giving Back — Many of us feel a desire to give back to the world in gratitude for the opportunities we had and the success we’ve enjoyed. This urge can take many paths. It might mean volunteering in your community, teaching to share your knowledge, or running a business or organization where the primary goal is not profit. That last point is essential. There is nothing wrong with making money, even while doing good. But when you are doing something for the love of it and for the benefit it brings to others, the flavor is different. The main benefits are personal, not financial. Caregiving — As many of us enter retirement or early retirement, it is common to have aging parents who need more help with their lives. It is also not uncommon to hear of grandchildren, disabled family members, even pets perhaps, consuming much of a retiree’s day. While we all hope for long, healthy lives for our family, and would probably not choose a full-time caregiving position, that work can still be rich with meaning. The stories of gratitude from those who care for others nearing the ends of their lives show us that, even if we inherit such a difficult task, we can still find happiness within it. Spiritual Growth — Finally, the clean slate of retirement is an opportunity for many to revisit, reaffirm, or redesign their belief system. During the working and child-raising years, the frenetic pace of life may have anaesthetized us to the big questions. Now is an opportunity to dig deeper. For some that means immersing themselves in church work, reaping the benefits of a close spiritual community. For others it means launching down a fresh spiritual path, freed from earlier constraints. That we are all closer to death at this stage is a persistent reminder to explore our relationship with something larger, before it’s too late. For many, this is the basis of all we do in retirement, and in life. I’ve been retired just about exactly eight years now. The first six months after I stopped working, I didn’t have any agenda. I decompressed from my career, spent the summer traveling, and dabbled in writing some articles that would eventually become the basis for this blog. In late 2011, I kicked off the blog and within a year it had become the overriding purpose of my retired life. Researching retirement-related financial topics, helping readers with their questions, and turning the blog into a viable business with a modest income consumed all the time I wanted to give. Other than outdoor recreation, and supporting my wife in the last years of her career, the blog consumed the majority of my free time. As it became more successful, I found myself turning down opportunities for growth, just to keep my semi-retired lifestyle from becoming a full-time business. Then, about two years ago, Chris got involved, gradually taking over more of the writing and daily operations. I’ve been stepping back, writing less, offloading duties to him. With more free time, last year I dabbled in homesteading, locating, buying, and improving vacant land. But, after an enjoyable summer of working on the property, I pulled up short at breaking ground on a second home. I couldn’t justify the cost against the amount of use it would get. And, I wasn’t ready to spend a year of my retirement managing a construction project. I’d rather go hiking or camping! So the past couple of years have been an experiment. I’ve been trying to re-retire, with no expectations or obligations. I’ve unsubscribed from emails, reduced my correspondence, and said “No” to commitments. I’m finally almost recovered from a debilitating ankle injury. (You’ll never take the pure joy of walking for granted again once you’ve lost it!) I’ve doubled my level of exercise over the past year, getting in shape to tackle my outdoor bucket list. It’s meant less desk time and less creative output. But being outside is highly meaningful to me and more important right now. I’ve also reached out to volunteer at several trail and land conservancy organizations in my region, hoping to give back to the causes that are most meaningful to me. I’m finally at the point where I’ve accomplished most of my personal goals, and can think about leaving a legacy for others. I believe that an overriding purpose or two will make your retirement happier and more meaningful. But the choice of that purpose is not static. It might change over time. Mine has. And for others? I’ve interviewed a half dozen readers on this topic already. It’s early to reach broad conclusions, but the threads have been interesting. For starters, it seems clear that those who plan are happier with their life in retirement. So thinking about how you will spend your time once you are no longer working is a wise investment. Common themes include travel, fitness, and being outside. Also church, friends, and family…. But it may not be enough to do the same old things in retirement. Developing a unique creative outlet has been important to many of us. And branching out to expand your personal network beyond transactional working relationships can be highly rewarding. Finally, several readers suggest that the quest for purpose itself is important. That purpose and meaning are self-defined, and may not have a clear end point. Which, if you think about it, might be encouraging news…. And what about you? What is, or will be, your purpose in life when you no longer have to work for a paycheck? If you have thoughts, opinions, or stories, please leave a comment below…. A good discussion. however I suggest each person reread it, especially the first 5 paragraphs and change the words ‘retire and retirement’ to ‘live or living’. If you don’t have an answer that fits with asking yourself why you are living now, you wont have one after you retire. In fact if your prime answer is ‘so that I can retire’, then you will be in a tough place. I had a list of goals when I retired, including building a model railroad in the basement (which meant getting a good dry basement that I could finish to my specifications) and the desire to take geology courses. The latter goal substantially influenced our choice of location, I wanted to move north (from Northern VA), near a state university (lower costs for residents) that has a geology/earth sciences program. Turns out geology programs are relatively rare. This semester I’m taking my second course (mineralogy – it’s been a challenge). Wife has had less success, she didn’t really have a plan for what to do. She’s tried to get involved with some social/charitable groups with mixed results. But she hasn’t found any real friends here, and I know that bothers her. The other goal we’ve had is travel, and now that the house has been refurbished, we’ve gone on a couple of trips including a “bucket list” trip to Egypt and Jordan. As long as our health is good, I’m hoping we’ll continue to do 2 trips each year, scheduled around my university classes. Interesting details, and some common threads here. Thanks David. What would we do if we had 1 month (6 months, 6 weeks, 6 days, 6 hours or 6 minutes) to live? As a geologist who is retiring in 3 months – I applaud you! Nothing like seeing the world through a new set of eyes when you travel – or when you are at home! I can’t wait to visit geological sites on my bucket list – old and new ones. Caregiving can also mean watching grandchildren while their parents are at work. I can’t think of a better gift (peace of mind as much as financial help) to your children and a wonderful way to enjoy the next generation while building a bond with them that they will remember long after you are gone. My mother passed away recently, and it was very touching to understand the gratitude of the grandchildren of the time their grandmother spent with them . . . something that not all of their friends experienced. Thank you, Darrow! I always read your work and pay close attention to everything you write! This is an excellent piece and very timely for me. I am 56 and about to retire. Your work has been so incredibly helpful to me being able and ready to take the step. Thanks again! Great to hear, thanks DJ! I agree with Judith’s comment I am gifted to be able to care for 21 month old grandson typically two days a week. My life as giver is fulfilled -helps his parents, stimulates grandson and keeps me laughing. I am in my third year of retirement for organizational responsibilities, although I don’t feel very “retired”. I deeply appreciated the the ten themes and agree with the comment they should be revisited every year for the first five. The phrase that rang absolutely true for me was “Retirement is not necessarily a time to stop working. It is a time to stop working at tasks you don’t like, or for money alone. “This is the part I enjoy the most. I’ve been blessed to distill the parts of my career I loved (advocacy, strategy, persuasion on issues I care about) away from the parts I was longing to release (supervision, labor negotiations, fundraising, 24/7 access). It is a joy to have begun at age 57. My husband will retire in two or three years so I’ve had some time to “try on” roles: writing a bit, learning a new language and my favorite…learning to play an instrument after decades of envying my husband and kids whose musical pursuits I supported and enjoying our first grandchild more that I could have ever imagined. I do think staggering the beginning of retirement is important for a couple. There are a lot of changes that might be a little overwhelming if you both take the dive together. I really enjoy “CanIRetireYet?” however this particular edition is one that I will share with every current and prospective retiree I know! Thank you. Thanks Laura. Sounds like you’ve very thoughtfully combined the best parts of your career along with some new pursuits. We staggered our retirements too, thanks for pointing out the value in that. Appreciate the details and the support! Thanks Steve, JD and NewRetirement are both excellent sources on this topic too! I have taken a right turn as I transition from full time employment. I have taken to teaching at the local state university. I spoke with the dean and we agreed on a few subjects. I am teaching Social Media Marketing to graduating seniors this semester, the class is part career preparation, part marketing fundamental review. It is an interesting group of 47 students. I am also doing a bit of marketing consulting, helping an engineering team get their product positioning and collateral put together. The teaching calendar should still let us travel, though we did take a major trip to South America in January, before the semester started. Sounds like a nice balance. Valuable subject for those seniors too. But the choice of that purpose is not static. It might change over time. I’m only semi-retired ans still in my 40’s, and for the almost 2 years I’ve been working half time my desires have already changed a bit. I can see myself always being focused on fitness and health, but I imagine some mixture of travel, giving back, and caregiving among others occupying the majority of my time at some point in my hopefully long future. To me life is very dynamic and I don’t see having one purpose but moving from thing to thing as my desires and the need arises. Vital subject matter for anyone in or contemplating retirement. Your ten points are right on for me. I retired at 56 and am nearly four years in. My wife retired at the same time and am glad she did; I wouldn’t have retired without her, my fear of boredom was high and still is. And I have tried to find purpose but it’s elusive and I haven’t found it, yet I’m not convinced I need to. I still feel some anxiety if I don’t accomplish anything in a day but those accomplishments are now easier to reach, less consequential, and may only take a few hours out of my day. Now exercising, reading, tinkering with a hobby/ project, or socializing satisfy me. One of the best parts about retirement is not having to be anywhere in the morning! Mitch, that’s an honest assessment of a lot of my days too. Thanks for the thoughts! Agreeing with DJ’s comment, I want to thank you Darrow for your excellent writing. I am turning 53 in the fall, pretty much retired. The info and ideas you provide in a clear and straightforward way are always a highlight in my reading. I wish you all the best! Thank you Dan, much appreciated. Early retirement lays bare some of the evolutionary machinery of the human mind. Some quick examples. Biological organisms are goal directed by nature. In earlier hunter gatherer societies, those goals were crystal clear and immediate: find food, shelter, a mate, etc. You didn’t have a lot of time to think about hobbies. Fast forward to today’s modern environment which bears little resemblance to the evolutionary landscape in which our brains evolved, and the disconnects become apparent. We often feel anxiety, boredom, and other negative feelings when we do not have goals. Often we chalk this up to not having “meaning” in our lives, but I think it helps when we can realize that there is a basis in these feelings in how the brain is wired. If you think you can go through life without goals and feel happy, you are most likely mistaken. Now imagine an early retiree, who apparently has all the resources required to secure all the obvious goals in life (food, shelter, etc.). This is naturally going to create angst (on average, not everyone), and we often start down the path of securing goals to alleviate that angst. Another example for men at least is status. It is a fact that women desire status in men which often equates directly with their ability to provide resources (e.g. see David Buss, 2016). When you quit your job, much of the status you had previously accrued disappears as your ability to generate resources changes dramatically. It would be interesting to see the divorce rate among early retirees. I know it played a large role in mine. Men are hard wired to accumulate status, because they know that this is what makes them attractive on the mating market. When that status drops, they will generally feel angst, whether they consciously understand where that angst emanates from or not. This phenomenon is well documented in Evolutionary Psychology. My whole point is that by better understanding Evolutionary Psychology and the hard wired tendencies in the brains of humans, you will be better able to predict, understand, and ultimately deal with the complex emotions that come from something as dramatic as early retirement. Darrow, you clearly have some angst as shows up in your posts periodically, including the last one about the things you gave up for early retirement. I am going on a month long road trip in your direction shortly. Let me know if you’d like to chat more. There “may” be some truth in what you say, but I have not seen it in any of the retirees that I know. Every one of them says “I don’t know why I waited so long” and “I do what I want, when I want to do it” and no one frets about loss of life purpose or other navel-gazing. Darrow, there are already too many retirement blogs trying to explore “the meaning of life”. Please don’t turn yours into one as well. Before you turned over the reins to Chris, this site had a lot of good actionable information. Not so much since then. Larry, I hear your objection, and I’m sensitive to the concern, but I can’t offer a direct fix. It’s true there is a different mix of information here, but in recent months we have published articles on taxes, credit cards, investing, returns on cash, the ACA, and health care ministries. Chris and I are going to keep following our hearts and writing about what interests us. To do otherwise would turn this into a “job.” As you point out, there are lots of other blogs out there to read. Understood, Darrow. We know that Chris bought the blog from you somehow. (He has admitted that the specifics of the arrangement were never disclosed. Nor am I asking for that to happen.) But clearly he’s still in “learning” mode about topics that you already wrote about – quite well – in the earlier years of this blog. And yes, I have moved more toward blogs like Kitces that focus on the dollars-and-cents side of the ledger. To get back on topic, I’ll repeat that I simply don’t know any retirees that regret their decision to pull the plug, or that worry at all about “purpose”. May I also ask, where were you “talking to blog readers about what has given them purpose”? Did you start a discussion forum somewhere? I follow this blog pretty closely, and you’ve been largely MIA in recent months. Agreed, I very rarely hear of a retiree that regrets their decision to leave a career. However, as a number of comments here demonstrate, many of us do wind up thinking about purpose, after a while if not sooner. I’ve been pursuing this topic in private emails and conversations. I have reduced my online footprint and will continue to do so. It can be taxing. Thanks David. I’m sympathetic to those insights from Evolutionary Psychology from my reading too. But we shouldn’t oversimplify. For example, an intelligent partner can assign high status to an individual who is respected by others, financially independent, master of their own schedule, and able to lavish time and attention on their partner. It’s not necessary to accumulate ever-increasing resources for status once you have enough to be in the top 5 or 10 percent, already. I try to be honest in my posts about the financial and emotional challenges of retirement. My life isn’t perfect, but Caroline and I seem to live a blissful existence compared to many humans I observe. Thanks again. Sounds like we could have an interesting conversation. I may be in touch! I was thrust into “retirement” last year at age 65 when my IT mainframe support position was eliminated from outsourcing. It’s been exactly 12 months since then, and after having marched to a clock and pager for 40 years, my transition into retirement has been challenging. The first couple of months was a big breath fresh air, no more alarm clock, no more being rousted awake in middle of the night by an unsympathetic on-call pager… but now it’s been a fight between the ingrained “rhythm” developed from those 40 years of being, for lack of words, always “switched on”, and the desire to put all of that behind me. It’s been a challenge trying to undo a 4 decades old habit. I’m discovering the finding a different purpose/mission, and reprogramming, or more accurately, de-programming oneself from their previous life, is essential in transitioning into an enjoyable retirement. Get on the board of a non-profit. There is so much need for a person like you who wants to keep hammering away. Start attending meetings and ask questions. You’ll get sucked in quickly. And you’ll be really appreciated. Yes, I would be open to a more in-depth conversation on this topic. I am now 2 years retired at a more traditional age of 66. I have always been interested in “meaning”. I was a philosophy major in college and was ultimately a PhD candidate, but never wrote a thesis. Afterwards, I had a wonderful career in physical therapy for 40 years, but never completely abandoned reading the area of religion and philosophy. I think what makes retirement so difficult for some people is that it is becoming a blank slate, even more so than if you retire earlier than the traditional age. Research seems to indicate that having no choice is undesirable, but also that having too many choices is just as bad. If you haven’t entered retirement considering what might be meaningful to you, you may be the proverbial ship sailing without a rudder. I think the same problem occurs in finding life meaning in our times. Prior to the 20th century, many people were given meaning via religion: an ethical system and a purpose in life. Many recent thinkers say we create our own meaning. But if you no longer have the basis for this creation, the task can seem impossible. Viktor Frankl, in his book “Man’s Search for Meaning”, made his case for this: from possibly the worst possible circumstance that anyone can imagine, he found a way to make his life have purpose, survive, and live on. So finding meaning is always possible, but it may be easy. I think it is always desirable. Thanks Mark, I may be in touch. Darrow, one of the great things about your article is that you find these amazing resources that I’ve never heard of. First, “Younger Next Year,” and now ClearerThinking! Thanks for getting me out of the rut of NYT, the Atlantic, and MIT Tech Review! Lastly for a very novel take on spiritual growth I might recommend Michael Pollan’s new book, “How to Change Your Mind,” which examines the impact psychedelic substances can have for people searching for meaning, or even coming to terms with things such as aging and serious illness. You might find it intriguing. Judging from your experience and the varying opinions here and across the FIRE blogosphere, retirement seems like it can be as much a test as a reward. My highly capable wife left her profession exactly one year ago today. More accurately, she fled a poor manager. At 56, she’s enjoyed a refresh in that she’s lost 30 lbs, works out several times a week at a gym she loves, joined a couple of boards and indulged her passion for local history and architecture. She no longer cries regularly as in the old job. On the other hand, she entered retirement with no plan and she struggles with her self worth too much regarding being unexpectedly unemployed. She’s had a hard time finding new work but is about to start a part time job in a new field that she’s cautiously optimistic about and will provide a way to occupy her big, self-critical brain. In watching her for a year, retirement both tantalizes and scares me a little, and that’s no April Fool’s joke. Thanks for your perspectives above. I used to have this vague idea of early retirement as simply an escape from a job I didn’t enjoy anymore. But then I realized that I didn’t really have any hobbies to work on while retired! Since then I’ve started drawing fantasy maps and writing on personal finance. I plan to keep working on those when retired as well as working on my fitness and going more to nature. I think it’s extremely important to have some goals to pursue when we retire. School and work teach us to follow instructions, so it can be scary to suddenly be the boss of your own life. But you gotta do it, otherwise what the heck are you going to do with 16 hours of free time a day? Thanks for the post. The way I view this is that like most people, I describe my job as taking 8 to 10 hours each day. But practically speaking, I only really “work” for 3-4 hours in the morning and 3-4 in the afternoon. Let’s average that out and say that I “work” for 7 hours a day. I commute for about 30 minutes total. That’s 7.5 hours. The remainder of the “8 to 10” is used on breaks, meals, and other activities of daily life. I imagine that your “16 hours of free time” breaks down in a similar way. You’re already using a lot of it, so you won’t be getting as much “free time” as you think. Now with all that said, do I think I’ll have trouble finding ways to use an extra 3+ hours in each morning and 3+ each afternoon? Not at all. Instead of a rushed 30 minutes at the gym, I can spend 2 hours if I want to. Everything that I currently do in a hurried and half-hearted way, I can do better at. More time for reading and all the other things that this article suggests. That additional time will be put to good use, I have no doubt about that. Will I need “goals” and “purpose”? Those are corporate notions and I really don’t see why I should continue to have them. I retired at the age of 50, almost 4 years ago. I used to work in a country which was not my country of birth. And, after having worked there for over a decade, I was bored-out by it. So I quit and moved to yet another country (I didn’t move back to my country of origin). I had prepared my “voluntary early retirement” by thinking how I would fill my days, what things/hobbies/sports I would do once I didn’t have to spend 9+ hours a day in an office. My wife had done the same. We don’t regret the retirement choice we made. We also notice what you mention in the article: the emphasis shifts over time. In the beginning of our retirement “thing A” was most important, but some time later it shifts to “thing B”. Conclusion: we are still alive, and our priorities change over time. I like your website and read most blog entries. I must admit that I skip items related to US health care system and US tax system as these are not applicable at all to me. I would be interested in sharing my story. I was planning early retirement but spur of the moment left work right before I turned 50. I didn’t have a plan of what I would do and I’m so grateful that I didn’t. I didn’t realize the amount of time it would take my brain to “heal” from the constant stress of a full time corporate job. I eventually put a cartoon picture on my vision board “aka my fridge” that is captioned “Throw things at the wall, see what sticks, if nothing sticks hang out in the pile”. And that’s exactly what I did. I tried out many new ideas and personas. 1 year 8 months into my retirement I have settled on spending lots of time doing humanitarian work and projects. I even did hurricane relief this year! If you know me you would not believe that I left my husband alone while I slept in tents and worked in shelters! I also spend a ridiculous, luxurious amount of time planning trips from my husband and myself. He is still working so we get 4 weeks to travel together while I am also free to do spontaneous trips with my girlfriends. Thanks Roxanna, love the cartoon caption and your personal take on this issue. Wow, Darrow, you really nailed it with this post! I escaped from the workforce three years ago shortly before I turned 59, and my husband left several years before I did. Our conversations about what our retirement would look like went a long way toward making the transition a smooth and satisfying one. Not a day goes by that we don’t appreciate the freedom that allows us to spend time on the activities that are important to us instead of our employer. You mentioned what I truly believe is a critical question: What are you retiring to? Many people view it as retiring FROM work as opposed to retiring TO the next exciting stage of life. The necessity of focusing on the financial planning required for a successful retirement often eclipses the need to consider what priorities will drive the scheduling of our days and the activities that will fill them. I would certainly be interested in further discussion if my background would be a good fit for whatever you have in mind. Feel free to check the “About Mary” page on my blog if you’re interested, and please know that I’m also our family’s CFO and responsible for all of our investments. It would be a pleasure to give back in some way since your blog has been a great source of information and inspiration to me for a number of years now. Thanks Mary, I enjoy your writing too. Sounds like you’ve given these issues some thought. I may be in touch. It would be a pleasure. And my apologies if you got hit with several comments at once yesterday. We were on the road with spotty service and I was having some difficulty getting through – or so I thought. Was laid off in August 2015 from a large networking company. 6 months later, went back to the same company doing the same job as a contractor. That job lasted 6 months. About 1.5 years later, went back to the same company yet again as a contractor. That job lasted about 6 months, and decided to terminate the contract due to the ACA subsidy cliff, and plus my contract was formally ending about 4 months later. Plus, I really just did not enjoy the job. It’s been a struggle. I have no interest in doing networking , or being tied to a daily schedule to be somewhere. Overall, our finances are in good shape. My wife enjoys gardening, and does a lot of volunteering at the local arboretum. For me, I spend about 1.5 hours at the gym every day, and do daily chores around the house and yard. We have done some traveling. The only reason I went back to work the last time, was to get out of the house. I’m still trying to figure it out after almost 3 years. BH, what has been a “struggle”? I just don’t see any struggle in what you wrote. You worked when you wanted to. Your finances are good. Do you still have some emotional attachment to work, since you were laid off? You were able to do contract work and say that you no longer have an interest in it. I’m just not seeing a struggle. You have the “time freedom” that I long for. This was a thought provoking post, with a very good framework that all should consider when contemplating post-retirement life. To your question – what has provided meaning and purpose to my post retirement life? – After 5 years of retirement (at 49 years old) – I have found purpose and meaning through: spending quality time with my wife and family; caregiving for elderly family members; reconnecting with friends; making new friends; travel; learning new skills (in cooking, healthier lifestyles, travel, fishing, hiking, managing investments and finances); sparking my curiosity(in various ways); exercise and health, and volunteering in nonprofit organizations. We have traveled over 9 months of every year since we retired (primarily via an RV in the U.S. and Canada – but also outside of North America), and have had wonderful opportunities to be immersed in nature (in wilderness areas, state parks and national parks and monuments), experience different regions and cultures, extend our knowledge of history, try new foods, experience the arts and culture, etc. What has been helpful to me, is to think about my post-working life as a process, with different phases (not a fixed goal). Like you, I have learned not to take on too many fixed obligations at this stage (shorter term volunteering stints for example), as these may reduce our opportunities to experience nature, travel, and visiting friends and family. After many years with a time consuming and rewarding career, we are trying to stay open to change and life experiences and to stay curious…. Thanks for the perspective and details Ed. Sounds like you’ve tried much of the list over the course of your retirement so far, and found it rewarding. Agreed about avoiding fixed/longer-term obligations. Great article. Where are those mountains? 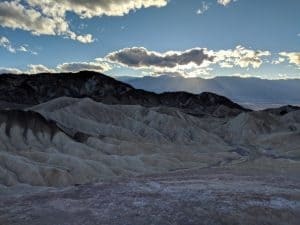 Telescope Peak, Death Valley National Park. I was introduced to this blog about 6 months ago by my brother who retired at 52. Its been a great resource for things to be thinking about that I may not have considered or even knew I needed to! I am 56 and have set Independence Day 2020 as my Independence day (I will be fully vested in my 401k by then). My finances are such that I can live comfortably and do pretty much do whatever I want to. The affordability of healthcare does scare me quite a bit, but I am hopeful something will change by the time I need it. I am researching options to work part time in a place that offers health benefits. A rare unicorn I know, but I know they exist. I live in the #1 Rated place to retire according to US News already so no need to move. Because of that, there are so many opportunities here to experience new things, learn, and participate in fun activities. Whenever I see something I’d like to do, but can’t because I’m working, I say to myself “I can do that when I retire” and put it on my list. I agree with the person who said he didn’t need to rush through events of the day like time at the gym or lunch with friends or reading. I am looking forward to that. I already work in the nonprofit world and would like to be a volunteer for some other worthy local ones. When people around here say they are retired, especially if they are younger, its almost a status symbol. “You must have done something right” they say. I love this article. As someone looking to retire in his early 50s (target date: December, 2021), I really appreciate the insight into the struggles one faces if they do not plan properly. Having a few hobbies, my first grandchild on the way and a nonprofit to run should head off most concerns, but this article has certainly generated a lot of thought to define what my ideal retirement looks like….thank you! Great article, Darrow. I’m printing a copy for frequent review and will share with friends who are nearing or are in retirement. My wife and I retired together 4 years ago (I was 55) and we were heavily involved in caring for her aging parents with dementia. Her Mom died in 2017 and her Dad passed Oct 2018, so we find ourselves beginning a new chapter. As you say, things change. Now we are looking to extend our volunteerism, and balance that with a healthy amount of selfish “fun time” of the recreation, hobbies, and travel that you mention. More of our friends are retiring, so that creates more opportunities to share the fun. Glad you are healing. Thanks again for the thoughts. Thanks Mike. Enjoy the balance, sounds like you’ve earned it. And I should have said, if you would like to talk more, I am open to it. In fact, my group of 6-7 buddies cover the range of voluntarily retired, laid-off-and-can’t-find-a job-retired, wealthy but still like working, wanna retire but need the money, and too young to think about it. We get together for a monthly pub night. You’re welcome to join us for a focus group conversation, as we do talk about this more and more. We’ll buy the beer. Thanks Mike, I appreciate the invite. Let me see where this goes and I may get in touch. I’ve been retired going on nine years. I did thirty one years in civil service and retired at fifty two. Worked part-time to get my quarters for social security, Medicare was paid in my career. I plane to never work for pay again. Everyday I swim, play cards, play America majong, play poker and sometimes win. Projects around the house. Stress is something I never want to ever face. My normal hours per week averaged 96 hours plus. Never being on call was the hardest thing to overcome. Healthcare was promised at zero cost and was for two years cost are now rising and projected to keep increasing. Thoughtful article & totally agree. I’ve been retired 8 years. Early retirement was unexpected and a difficult decision. Since I retired, I tutored English to refugees, worked part time for a year, learned how to grow vegetables at a community garden, volunteered for the visually impaired and am now in a more challenging volunteer position at an airport information desk. I love to see planes fly! I exercise five days a week, sometimes 2 and 3 classes a day. I attend lectures and classes at a local community college in a program for older people. I take arts and crafts classes. I learned how to sew. I returned to a childhood love for drawing and art. I travel to pursue a hobby. What I like about retirement is meeting new people, learning new things & having new experiences. Each day is different. Each year is different. I miss my friends and family. They’re still working. Keeping in touch and maintaining a social life is more of an effort. I don’t miss rush hour travel. Darrow, it’s great to see you back at the keyboard, and I LOVE this post. I retired 10 months ago and I’ve found a real purpose in my blog as well. I love the concept of mixing things up, and have been inspired by your post to start a sabbatical this summer while we’re traveling to the Pacific Northwest in our RV. I’d love to talk to you in more detail if you’re receptive to including me in your interviews for your project. I’m intrigued. Thank you for inspiring those of us who are following your footsteps. Great, important article. I also have fitness and giving back as my biggest goals. Now, I’m volunteering five to ten hours a day. It’s hard not to fall back into the work habit, even when you’re working for free. We must get dopamine rushes when we accomplish something–especially something good. But i do wish I could “work” less and get off the computer. Fitness-wise, I hurt my back in October, December and March and I REALLY appreciate being able to walk outside now. You’re body becomes less pliant as you age so it’s better to keep stretching and look up bodyweight exercises and mobility drills on youtube while you’re young. Tennis is out. I’m back to short mountain bike rides, bodyweight exercises and long hikes. Regarding planning, the first thing I did was write “get a life” goals that I found on another FIRE site. I review them and revise every six to twelve months. It helps keep me inspired. Thank you for the excellent article. I especially liked the listing of retirement themes. Several of the comments were good reading also. car that I needed for work. So I did a contract job to finally get past age 55 and pay off the car. Although there were elements of satisfaction from completing tasks at my job, on my way home I would pass the bike trail that I loved to cycle and longed to do that instead of the long commute. When I finished the contract job I went on unemployment. While on unemployment, I had several interviews with some impressive employers that I would gladly have worked for, but nothing panned out. In retrospect, I think it worked out better this way. At just past age 56, the unemployment pay stopped and I retired. I am now almost 59 and loving retirement. The biggest change in my life is that I now put more miles on my bicycle than I do on my car. Last year I cycled 5400 miles and I cycled 7000 miles the year before that. I alternate each day between cycling and weights with a day off for rest about once a week. So I am big on the fitness theme. But I do some of the other retirement themes too with it varying from day to day depending on family needs, or even changes in the weather or what I want to do that day. That is the beauty of retirement. Unless something urgent comes up, you can do whatever you want or planned. When working, there never seemed to be enough time. Now that I have the time, I feel like I can take my time and enjoy everything, just like I enjoyed your article and the comments. John G, may I ask what kind of work you retired from, and what you are doing for health insurance? Software engineer. My wife and I are using a healthcare plan on the exchange from the affordable care act, bronze plan high deductible. I hope that option remains available until we hit Medicare age. I have not heard good things about ACA insurance. If you actually need ot use it, very few doctors take it, claims processing can be very poor, etc. What has your experience been? I realize that this is off-topic from the article, but it seems to have run its course. This is the most important unsolved aspect of early retirement for me; I’m not at all concerned about “life purpose” and etc. Sorry for topic drift. To answer, my wife’s preferred primary doctor would not take ACA insurance, so she switched to my doctor (not her preference). I was able to keep my primary doctor and specialist. She was also able to find good specialists. But, we are saving thousands this way, so it is the only good option for us. I recommend going to the healthcare.gov website, putting in the numbers, looking at the plans and looking up available doctors for the plan. I called my doctors before I started ACA insurance the first year. Don’t forget the cost of prescriptions, emergency room visits, lab work, etc. Also remember one rule if you go the ACA route, “Keep it in Network”. As far as claims processing goes, I have had no trouble at all. Customer service has answered any questions/concerns I have ever had. Thanks for the info John. My family Dr sold his practice to a larger company that accepts ACA, and he assures me that for any specialists I see who don’t take ACA, he could recommend equally good specialists that do. I have studied the ACA numbers in detail (although I’d use Cobra for the first 18 months after quitting work, and it will cost about half of ACA because I would exceed the cutoffs for ACA tax credit or subsidy or whatever). While I could certainly afford ACA (even though again, I wouldn’t need it for 18 months) I have no confidence that ACA will survive for as long as I would need it, and that’s what keeps me working. As I was scrolling thru the comments, this is exactly the conversation I was looking for! I’m thankful to Larry for asking the question and John for replying! This is one of the things stopping me from leaving early. I’m 51 and feel we have enough money to live how we do now, not frivolous but just doing things we love…camping in our RV, biking, walking, hiking, going to the lakes and kayaking, being w/ our dogs! Our kids are almost on their own and our vehicles are paid for. The house is almost paid for. We have a nice stock pile of $$ in our 401k’s and now we are eagerly working on getting a stock pile of $$ in an account we can take it out of when necessary. I wish I had fallen on these bloggers for retirement early a few decades ago!! None the less, thank you Darrow and like minded ppl like you who have written about your experiences and help ppl like me say hmmm I think I could do that too! Also, any more advice on healthcare if anyone has found a different way that works for them, I’d be most grateful and extremely appreciative to the information!